Anglo American has become the latest customer to sign a fuel contract with ITM for its fuel cell electric vehicles. Anglo American joins Europcar, Hyundai, Toyota, Commercial Group, Arcola Energy and Arval as an ITM Power fuel customer. The contract covers fuel dispensed across ITM Power’s hydrogen refuelling network. ITM Power is currently rolling out a network of 10 hydrogen refuelling stations in the UK of which 3 are now open for public access. Each station produces hydrogen on site via ITM Power’s rapid response electrolyser system, and can refuel a fuel cell electric car in three minutes. 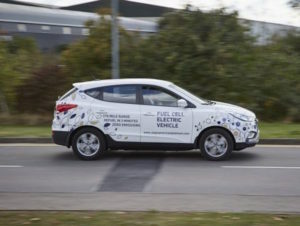 Andrew Hinkly, executive head of marketing, Anglo American Platinum, commented: “To meet the ever more challenging emissions targets being set around the world, the use of zero emissions Hydrogen Fuel Cell Electric Vehicles will increase. Rapid refuelling and the use of a renewable clean fuel offers a significant advantage.